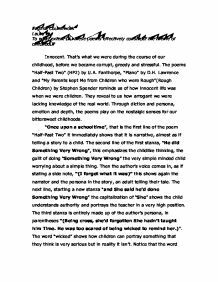 English Coursework Laura Hui To what extent did these poems effectively construct the theme of childhood? Innocent. That's what we were during the course of our childhood, before we became corrupt, greedy and stressful. The poems "Half-Past Two" (HP2) by U.A. Fanthorpe, "Piano" by D.H. Lawrence and "My Parents kept Me from Children who were Rough"(Rough Children) by Stephen Spender reminds us of how innocent life was when we were children. They reveal to us how arrogant we were lacking knowledge of the real world. Through diction and persona, emotion and depth, the poems play on the nostalgic senses for our bittersweet childhoods. 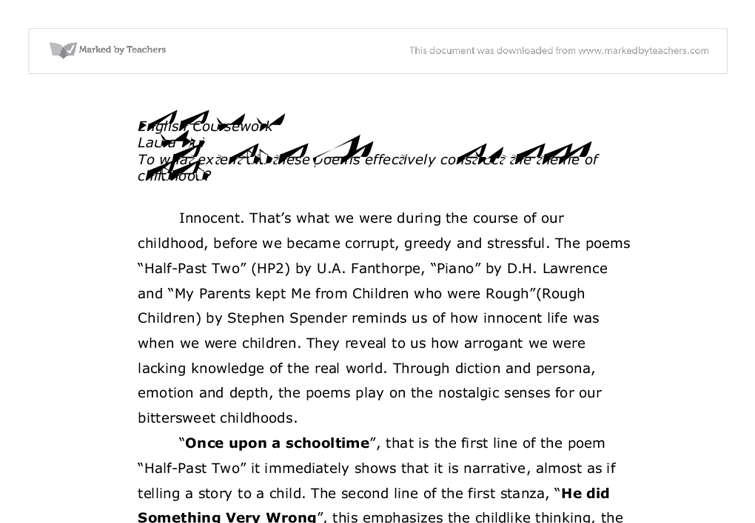 "Once upon a schooltime", that is the first line of the poem "Half-Past Two" it immediately shows that it is narrative, almost as if telling a story to a child. The second line of the first stanza, "He did Something Very Wrong", this emphasizes the childlike thinking, the guilt of doing "Something Very Wrong" the very simple minded child worrying about a simple thing. Then the author's voice comes in, as if stating a side note, "(I forget what it was)" ...read more. It tells of a man, all grown up, losing his innocence long ago and forgetting about it. He reminisces when something reminds him of his bittersweet childhood. Lawrence portrays the distinct childhood theme by using reminiscence, he paints a picture for you and using sophisticated diction he desperately longs for his childhood again. "Softly, in the dusk, a woman is singing to me;" this is the opening line for "Piano". Immediately it creates an image in the reader's head, picturing a musky dark place, with a highlighted woman, singing. The next line "Taking me back down the vista of years, till I see A child sitting under the piano, in the boom of the tingling strings" brings us back into the past, down the memory lane of this man until we see a frame of the child sitting under the piano. Using diction Lawrence creates sounds like "tingling strings". Also note that Lawrence is writing in the present tense to make us feel as if we're going down the memory lane with him. The next stanza starts off with "In spite of myself, the insidious mastery of song Betrays me back, till the heart of me weeps to belong." ...read more. The rough children saw through him though, they knew that he thought they belonged in different worlds and that's why they "never smiled" All three poems constructed the theme of childhood in different techniques. Which one did the best? That would be a matter of opinion. I prefer the poem "Half-Past Two", the childlike perspective and the diction and the compression of words really affected me. The poem made me think and reminisce too. "Piano" is a really effective poem also, but it is told from an adult point of view, in my opinion I think it constructed the theme of memories better than the theme of childhood. "My Parents kept Me from Children who were Rough" in my view is not effective. First of all it seems to be set in a time that's not modern day, and also it is a very personal and specific experience. Having never been kept from "rough" children myself, I cannot relate to the poem and in a way I don't really understand what it would be like to be in that situation. As I said, it's a matter of opinion, and I think "Half-Past Two" by U.A. Fanthorpe was an extremely witty and well written poem that to a great extent, effectively construct the theme of childhood. ...read more. This student written piece of work is one of many that can be found in our GCSE U A Fanthorpe section. Comparison of &amp;quot;The Thought Fox&amp;quot; and &amp;quot;Pike&amp;quot;. This is a reference to a phone, a 'haunted apparatus". If it cries- 'rings', we pick it up to our lips and 'soothe it to sleep with sounds', meaning we speak into it. If we tickle it with a finger, we dial into it. The sentence sounds eerie as the word 'drafty' implies a rush of wind, which can both send shivers down your spine, and is also commonly associated with ghosts. The line also seems depressive as it is making the birth, which was joyful and passionate in 'Catrin', seem like an isolated and scary experience for Plath. Comparing Disabled and Does It Matter? The euphemistic verb "losing", accompanied with the lack of imagery unlike in "Disabled", emphasizes the casual and seemingly uncaring mood of the poem. The poet goes on to say, "For people will always be kind, and you need not show that you mind when the others come in after hunting to gobble their muffins and eggs." This method of structure is used in a similar way by Seamus Heaney. The choice of a school setting in Carol Ann Duffy's 'In Mrs Tilscher's Class' is significant throughout, as school is a place where all of us have developed mostly in our lives. The Red Room was creepy and frightening, 'The shadow sprang back to its place', this quote suggests the candle went out and the shadow moved back to its original place. This will make the reader think that the shadow is jumping a step closer towards him. Both of the poems include various sounds that have a symbolic resonance. In ?Disabled? the sounds of the boys playing is taken in as a sombre occasion for the soldier, as they cause the soldier to remember he can no longer be as free as them and because of this, he will always be isolated from them. The poet used several poetic devices but one that triumphs was his distinct word placement and perfectly placed words and syllables. This portrayed the intensity of emotion in the poem since he knew the exact phrases and words to maximise the effect of presenting emotions in a sophisticated manner.